Mick cracking job, I was born in very small village in West Sussex (population 200 ish) with a large farming community. During my youth we used to see hares a lot, but a lot of water has passed under the bridge since. You have captured the spirit of a rarely seen animal. Thanks for the comments everyone. 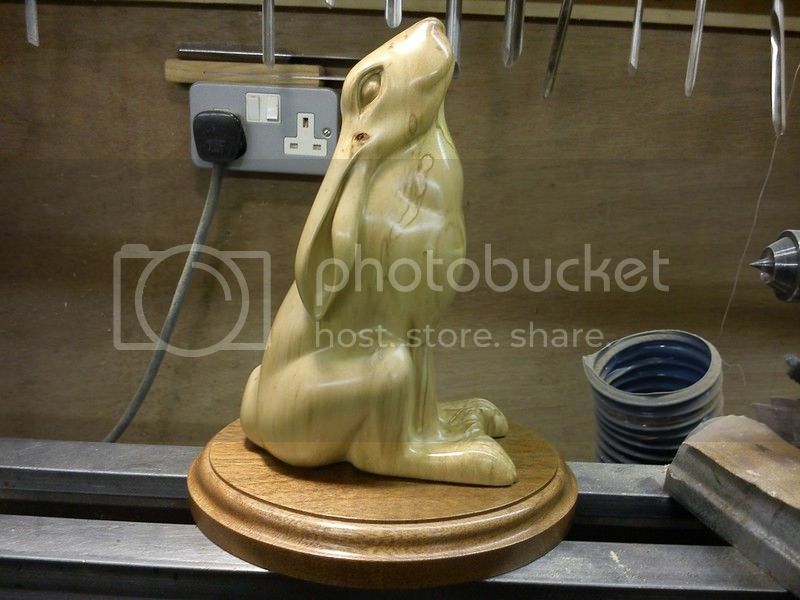 I will take a few photos of the totally finished job in the next couple of days , Imade a mahogany oval base for the hare as the grain was running upwards on the feet so a chance they could have been knocked off without a base. Hi Brian sorry for late reply, I had missed your post somehow, it was the woodcarver magazine the UK one, I will find out what number and date and post details with the photo. Hi John, I live in what was once quite rural place too , its getting built on in every direction so not so rural at all now, I have a dog a pointer that finds hares, rabbits etc and still take him to more rural places, he is 11 years old now and there are places where we always used to see the odd hare while walking where I have not seen a single one for say 4 years now. I think between building on their habitat and modern farming methods that seems to have no regard for the natural wildlife, the brown hare's future sadly does not look good. As you say thay are amazing animals to watch and considering they are always above ground its amazing how they survive the winter weather at all. 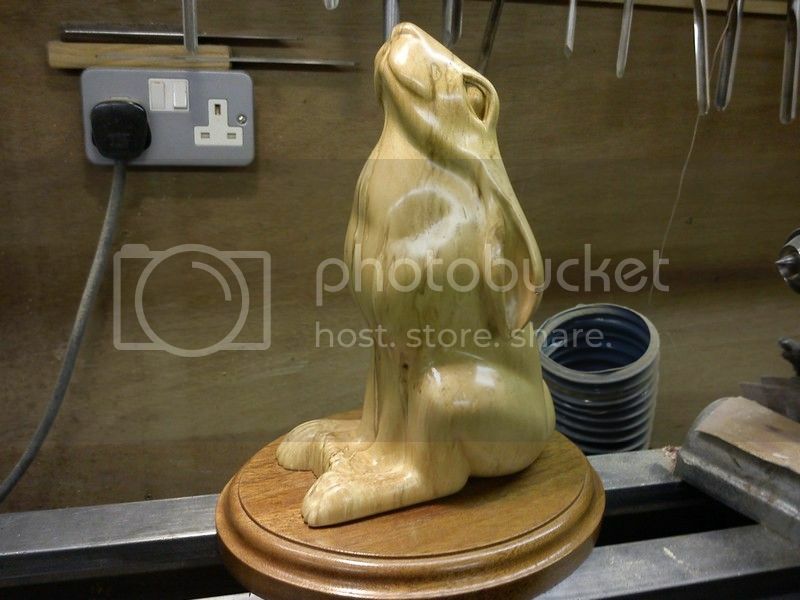 I am doing a carving of a pointer dog next that I will post but plan on doing more hares in the future as I like them in general but they are a good subject to carve too. I love the finish. What's your recipe for the beeswax and turpentine mix? Could you go into more detail on that procedure? Thanks Mick, appreciate it. Looking forward to the final pictures. Do you use a buffer to get the shine on the beeswax finish or lots and lots of elbow grease? Hi Brian and Don , here are a couple of photos of the finished thing, its not very good light but you can get the idea of the base. The design was in the UK magazine Wood Carving number 98 a project by Bill Prickett, I am not sure of the date as I was given only the copied pages I needed but can find out or if your stuck copy you the pages I have that have a side and front drawing and not too detailed step by step stages of doing the carving but enough to get you by. As for the finish, Its sanded down through the grades of abrasive paper using both sheets wrapped around various foam blocks etc and also dremel type sanding drums/ stones depending on the areas, I sand say 120, 180, 240, 320, 400, 600 grits so its really smooth then apply the wax then it really takes very little buffing with a soft cotton cloth to get the shine , you can do several coats of wax which seems to give it a deeper sheen. The Beeswax and genuine turpentine mix, I have actually used Chestnut brand Woodwax 22 clear , which after looking at the tin is a blend of various waxes including beeswax and carnuba wax, I am sure that just beeswax and turpentine also works but can check when I am back at the carving club. The Woodwax 22 clear is good stuff a soft paste wax that can be used for woodturning or normal rubbing on furniture or carvings, all I have done with the turps is mixed a few drops at a time in a small jar with the wax until its a sloppy slurry then brushed it into any small detail like the eyes etc with an old tooth brush then rubbed in with a cloth all over. As an experiment I warmed it over with an electric heat gun so the wax melted in on the first coat then buffed it off , this seemed to work really well I am glad to say and meant that wax did not clog the detail bits up. 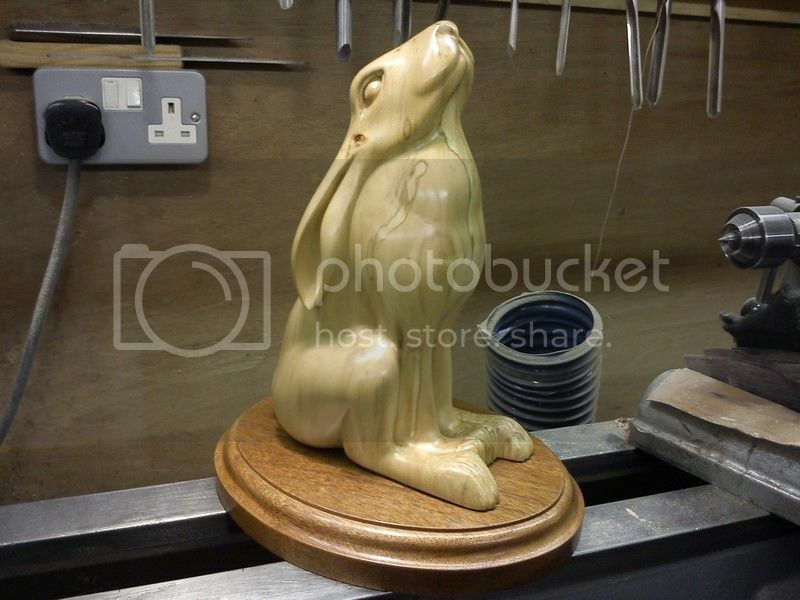 Mick, Cant wait to see the Pointer when you have finished going by the high standard of your work its gonna be a corker, will you carve the dog to a size to match the scale of the Hare. I made my living at sea for over 25 years, on my return in the late 60s after 12 months away I came home to find my mates dad had sold good arable land and the village had gained an extra 300 odd people all from London area, Chelsea Tractors (4x4), green wellies, wax jackets this was how they used to think we all dressed, More like thick heavy brown or green corduroy trousers and jacket, hob nail boots with leather chaps a flat cap with hairy baler string to keep it all together, we the locals used to give em hell, and bloody black Labradors or liver and whites (spaniels) some of these poor unfortunate dogs wound up on the wrong end of a 12/16 gauge shot gun due to irresponsible owners having no control of their animals worrying Cows with Calf, Mares with Foals and general wild life. Saturday night in the local pub got a bit rowdy. A majority had gone back to London within the year said it was to quiet a good result all round . Hi Mick, if you don't mind could I get a copy off you? I have spoken to the publisher of woodcarver magazine and surprisingly they don't carry back issues for more than 8 months ( issue 127) and I am too impatient to wait for a copy to come up on ebay. Wow absolutely brilliant, love your work.